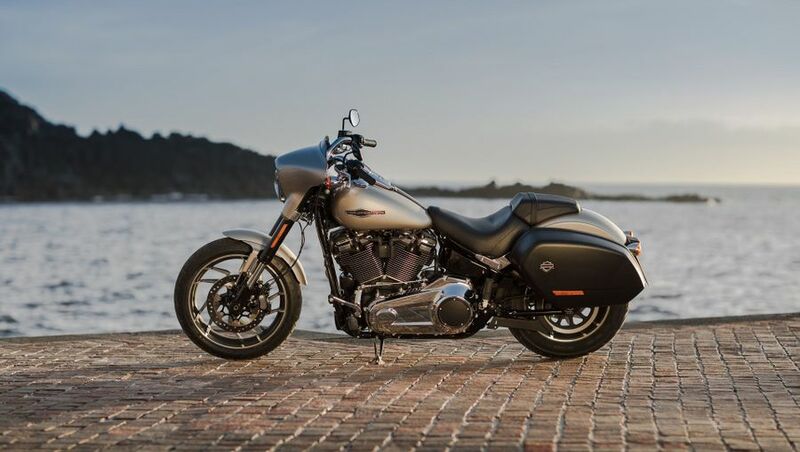 Latest addition to Harley’s massively updated ‘Softail’ cruiser family is an all-new model and brings, thanks to detachable fairing and panniers, true versatility. A true do-it-all Hog that’s still stylish and decent value. Classic Harley cruiser converts into a tourer courtesy of cleverly designed, quickly detachable fairing and panniers. It might not be an original idea but it’s brilliantly and stylishly executed. 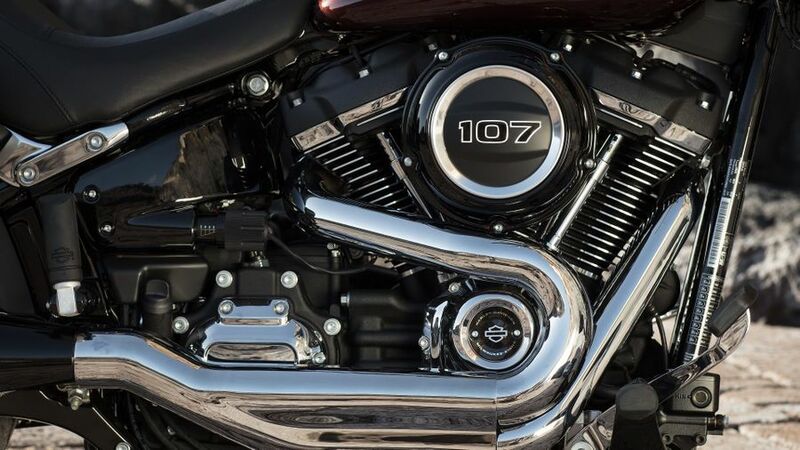 The base bike – Harley’s updated Softail cruiser with new, lightweight, stronger, monoshock frame, improved ‘Milwaukee Eight’ V-twin engine and improved style and cycle parts was already decent, as proven by the eight other new Softails introduced at the end of 2017. This additional version brings true versatility without compromising performance, style or value. The Sport Glide uses the 30º head stock version of the new Softail frame complete with narrower swing arm and an 18/16inch wheel combination. The result, along with a deeply padded seat, mild ‘Buckhorn’ bars and subtly-forward ‘Highway pegs’ is cruiser laid back, but not extremely so. The seat’s low, the riding position natural and comfortable and you feel fully in control. For a Harley, it’s beyond criticism, in fact. Latest ‘Milwaukee Eight’ version of Harley’s classic air-cooled, pushrod V-twin gains four-valve heads (hence the ‘Eight’ moniker) and partial oil-cooling allowing power to be boosted to 87bhp and peak torque of over 100ftlbs which, while hardly earth-shattering, is more than enough for most. Front end has rigid, USD forks as debuted on the 2018 Fat Bob and a single, ABS-assisted, front disc. That might not quite match the optional larger 114ci engine and twin discs of its Fat Bob hot rod sibling, but is ample for its needs. Those higher spec, 43mm forks, along with the Softail’s new, remote preload adjustable single rear shock and real world 18/16inch wheel combination, not to mention the middling 30º head angle, all adds up to a decent handling machine with a fairly sophisticated ride and precise steering. 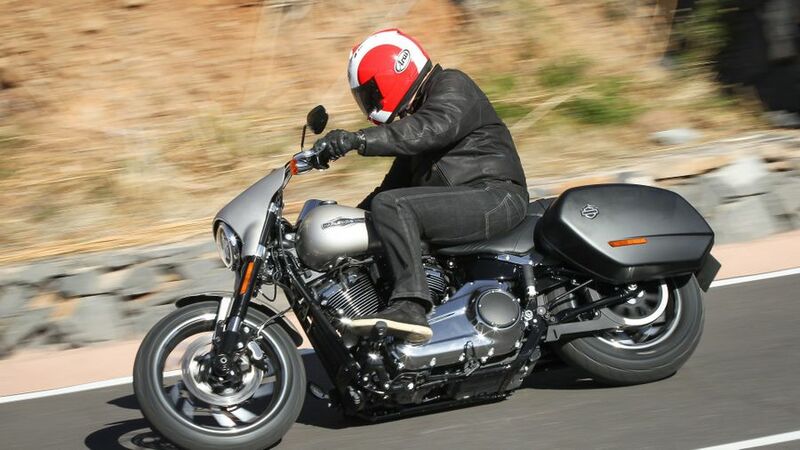 The result is one of the sweetest handling of all the new Softails: comfortable, smooth and steady in a straight line and yet precise and good fun to weave through the twisties. ‘Big Twin’ Harleys-are prestige, luxury machines so running and riding them can never come exactly cheap. That said, their fairly humble performance means consumption of consumables like fuel, pads and tyres is better than most big bikes while their novel belt drive system is very durable. Other plusses are the fact that mileages are often low, they tend to get very pampered by owners and residuals are market leading. Harley’s current big twin dates back to the introduction of the all-alloy ‘Evo’ in 1984, while its design influences go all the way back to WW2, so although updated into ‘Milwaukee Eight’ 1745cc form for 2018 it has plenty of proven history. That said, judgement must be reserved slightly as this version introduced partial oil cooling and more. Otherwise, as with most Harleys, the Sport Glide is fairly simple and straightforward with solid build quality, so we’ve little to fear. 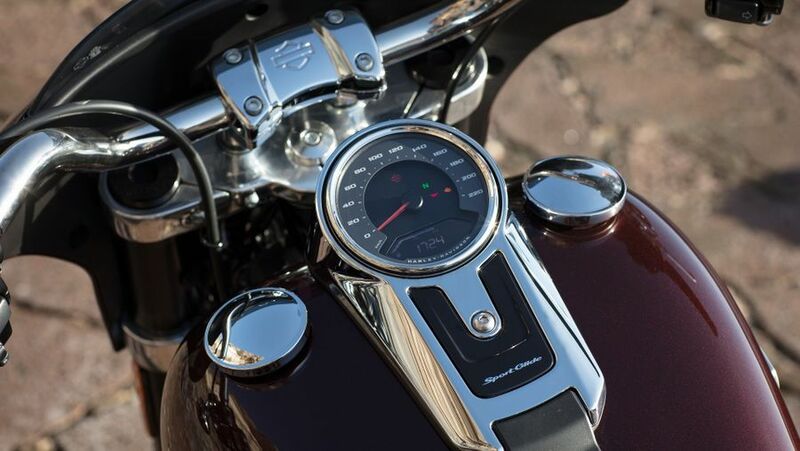 As with all other Harleys, and in fact as is common across most of the major motorcycle manufacturers, the Sport Glide comes with a manufacturer-backed, two-years, unlimited mileage parts and labour warranty. Servicing-wise, nothing has changed with the update with the Milwaukee Eight powertrain with full services required every 6000 miles. The Sport Glide treads that fine line between being a naked, bare bones cruiser and that of a fully-specced-up tourer so you’d expect some compromises. In reality, though, it has the best of both worlds. The detachable fairing is well made, easy to remove and you can go for an optional higher screen if you prefer. 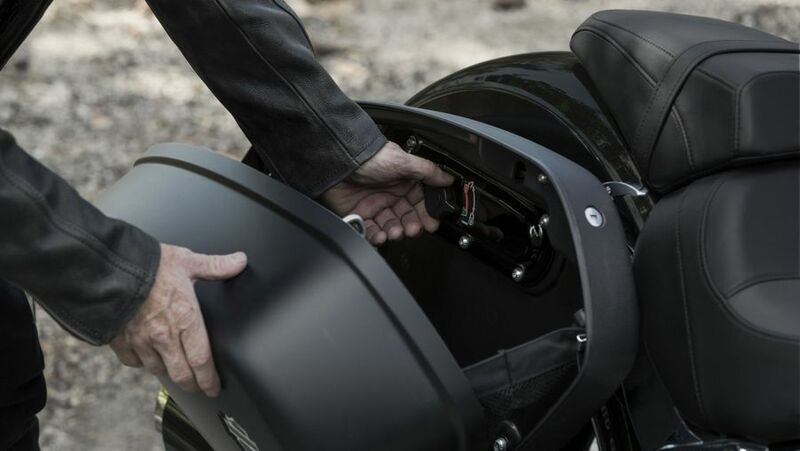 The panniers are equally good quality and pleasing to use while, rounding of the tourer attributes is the standard fitment of cruise control. Otherwise lights are snazzy new LEDs and there’s a switchable digital readout so it wants for nothing. Harley has dabbled with the ‘convert-a-bike’ idea before – and got it wrong. The similar Dyna Convertible of the mid-1990s had similar ambitions but failed due to a clunky screen and panniers combo and unattractive looks. Not so here. 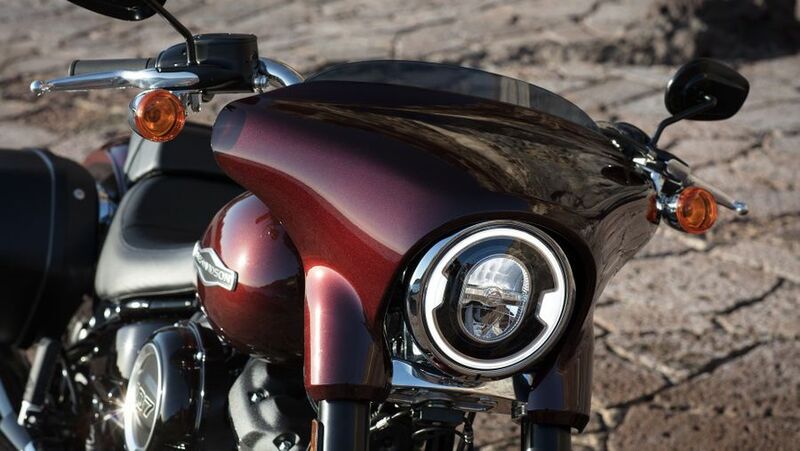 Naked, the Sport Glide is classic Harley cruiser. But clip on the panniers and screen (and it only takes seconds) and you’ve a great-looking, effective bagger that reminds of the hugely popular Street Glide – but at a fraction of the price!